The Delve League arrived with Patch 3.4, and introduced an alternative to the conventional end-game experience. Since then, Delving has become a core mechanic in Path of Exile. Due to its incredible potential for experience gain, profit, singular crafting mechanics, and entertainment, it is essential that all exiles have a firm understanding of the fundamental systems in play. All Delving begins in the Azurite Mine, which only be accessed after encountering Niko in Act IV. To [re]enter the mine, simply interact with any Waypoint and click on the icon in the bottom right corner, marked with a “Candle” icon. Delving is an infinite and randomly generated dungeon system that exiles can explore, shared between all characters on any given league. Players can move throughout the Azurite Mine by going laterally or downwards. Subsequent levels of depth increase the monster level, up to a maximum of level 83, and add additional damage and affixes to the monsters once end-game levels are achieved. The rewards also increase with depth, although this has diminishing returns after the first few hundred levels of delving are reached. Voltaxic Sulphite is necessary to power the Mine Cart, which allows the player to explore the mine’s depths. Sulphite can only be acquired by completing missions for Niko. 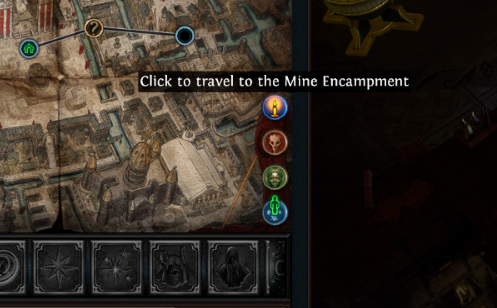 Exiles can travel to connected points on their subterranean chart, though each Delve costs a fixed amount of sulphite, which is based on the depth and the distance traveled. The Mine crawler will speed up to match the movement of the player if they are moving faster than the cart. If you venture into the Darkness, the Crawler will slow or stop, depending on how far you are from it. The Mine is in a state of perpetual darkness which can only be penetrated by following the Mine Cart during a Delve, or by dropping a temporary Flare on the ground (default key “6”). Flares can be crafted at the Voltaxic Generator. Standing in the Darkness will cause the player to take 2% of their Life and Energy shield per second, per stack (at 0% Darkness Resistance). This effect stacks every 0.25 seconds, and is cleared the instant you re-enter a lit area. Light Radius and Darkness Resistance decrease automatically the deeper the player Delves, but can be increased again using the upgrades the mine offers. Monsters that are shrouded cannot be damage by the player, so beware if you are attempting to leech off of them. Slayers (and Slayer Ascendants) will have a much easier time dealing with the Darkness, as the overleech will sustain you through a significant amount of Darkness damage. There are a variety of upgrades that can be purchased to facilitate further and more frequent delving. All of them require Azurite, which is obtained via delving, and can be purchased from the Voltaxic Generator found in the mine. The upgrades require progressively higher amounts of Azurite with each upgrade, which naturally necessitates deeper delving, where the rewards are more plentiful. Which Upgrades Do I Make First? When beginning a league for the first time, you may ask yourself how to best spend your early Azurite most efficiently. The answer is simple; in virtually every situation the best upgrade to purchase is Increased Sulphite Capacity. We recommend upgrading Sulphite Capacity at least ten times or so before making any significant investments towards other upgrades. This will grant you a Sulphite Capacity of 22500, which is a comfortable buffer so that you can encounter Niko multiple times before capping out. The cumulative cost is roughly 7000 Azurite, so it should not take long to achieve. Below we have provided a list that ranks our recommended priority for Mine upgrades. Since upgrades cost significantly more with each rank increase, you should still upgrade some of the lower priority options, as the low ranks will only cost a few Sulphite. The upgrades to Dynamite are significantly less useful than the other options. Rusted Sulphite Scarab: Area contains Niko. Map owner gains 50% more Sulphite. Polished Sulphite Scarab: Area contains Niko. Map owner gains 100% more Sulphite. Gilded Sulphite Scarab: Area contains Niko. Map owner gains 150% more Sulphite. It is usually only worthwhile to purchase Gilded Sulphite Scarabs over the other variants, although if your Sulphite cap is very low, you may find that even a single Sulphite deposit can overcap you in a high level map. Though they can be very expensive, they virtually always pay for themselves if you are at Depth 239+ (Level 83 monsters). Players who enjoy Delving often can use these Scarabs as a means of greatly increasing the amount of time they are able to spend in the Mine. Niko will appear every day on your Atlas, guaranteeing at least some Voltaxic Sulphite providing you have the required map. Niko is marked with a “blue gear” style icon on the Atlas. Fractured Walls appear frequently in the Mine, and can be destroyed with dynamite. While they are far more common than most players believe, they are generally found off the main path of the Crawler, well shrouded with Darkness. This means that if you are not frequently venturing off the main path using Flares, you are not likely to encounter many Fractured Walls. Fractured Walls often conceal valuable items and loot, and in particular, the “Resonators” and “Fossils” that are unique to delving. Certain rewards, such as 4-socket Resonators, can only be found behind Fractured Walls. Once you have reached end-game levels of delving, it is generally worth exploring the areas adjacent to the crawler’s main path. Longer delves will often have 2-4 Fractured Walls along their entire path, which can supply the player with tens or hundreds of Chaos Orbs worth of loot. Be sure to drop a Flare while looting your caches. Flares are arguably the most important tool you will leverage while Delving. Since Sulphite is a limited resource, getting the maximum experience and loot out of every Delve is highly recommended. Flares, on the other hand, can be crafted for only 5 Azurite each, and are practically unlimited, as you can return to craft more after each Delve. You can more than double the amount of monsters and wealth you accrue by simply exploring the side rooms while Delving and dropping Flares to ensure you survive and can properly damage the mobs. Upgrading Flare Light Radius is significantly helpful for players who frequently employ Flares while Delving. It is possible to Delve without Sulphite using Flares alone. This is done by simply crafting as many Flares as you can carry, traveling to a previously completed node on the Subterranean Chart, then clearing nearby monsters and side areas. This can be great for profit early in the League and also provides very competitive experience. With the advent of Sulphite Scarabs, this method is not quite as attractive as it was in Patch 3.4 (Delve League), however, it can still be a great method to employ to generate currency and experience. This is particularly pertinent for Solo Self-Found players, where access to Scarabs and Sulphite will be limited. Hidden Paths: Are They Worth It? You will often encounter points on the Subterranean Chart that cannot be immediately accessed by the crawler. These nodes can be accessed by blowing up a specific fractured wall. 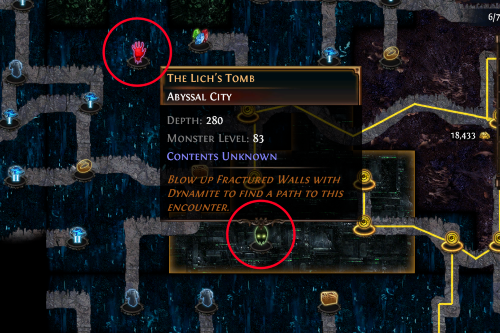 Once the wall is destroyed, the node will then appear as a possible connection on the Subterranean Chart, allowing the Crawler to access it like a normal Delve. In many cases, this is easier said than done. Like all paths on the Subterranean Chart, the Hidden Path must connect to another node. Consequently, you should always start exploring from the nodes that surround the disconnected node, searching for the correct wall to destroy. Searching for Hidden Paths is almost always a waste of time, due to the risk and time you must employ in order to find the Fractured Wall in question. In certain circumstances, you may decide it is worth it; for example, if you find Aul, the Crystal King, or another Delve boss you would like to defeat. Cities are typically the most valuable biomes to locate, mainly due to their significant Map Sustain potential. Cities are marked by an enclosed area on the Subterranean Chart; an example Vaal City is shown below. Despite the fact that the biomes have differing suffixes (Outpost, City, and Ruins, respectively), they are colloquially referred to as Cities by players. Vaal and Abyssal Cities can be encountered relatively early in the Delve progression, however, Primeval Cities can only be found past Depth 220+, and are less common. While the cities have different tilesets, they all have the same basic layout, shown below. The “Light Disks” referred to in the image can produce temporary lights that illuminate the city somewhat. 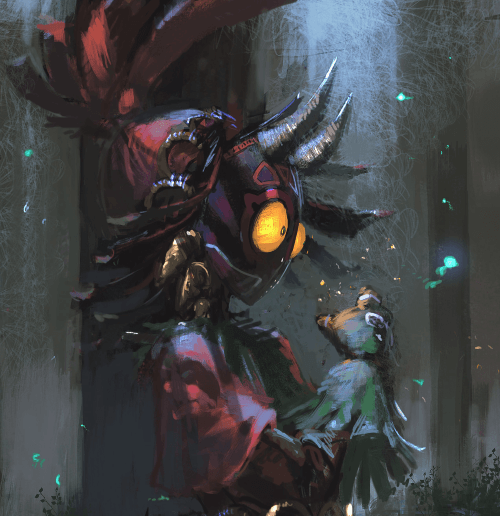 Standing on them counts as being “in the light”, and the player will not suffer damage from the Darkness. After several seconds of standing on the disk, it will “flare up” and illuminate the surrounding area and corridors. This effect will dissipate after around ten seconds, however, it can be reactivated or maintained by returning to the disk. The above layout can also be vertically mirrored, but the basic premise is identical. The rewards for cities can be substantial. An example below illustrates an extremely lucky outcome, with the resulting maps being worth several Exalted Orbs at the time in the League that they were found. A player that is exploring cities and deep in the Atlas progression in the first month of any League can produce very steady amounts of high tier maps, and therefore achieve much greater profits or experience rates. While not every city node will produce such dramatic returns, you can expect to find at least one Map chest in most cities that are Depth ~200+. Delve Bosses can only spawn in the City biomes named above, and are even more Rare than the cities themselves. There are 3 Delve bosses, and each is related to the biome that they spawn within. The bosses are arranged in difficulty, with Aul being by far the most difficult of the three for most builds. Delve Bosses scale with depth, meaning that they become significantly more difficult as they gain additional affixes and damage. The Delve Bosses drop a variety of Uniques that can only be obtained from them specifically. For example, Doryani's Machinarium can only drop from Ahuatotli, the Blind, and can be extremely valuable at certain points in the League. The loot pictured in the screenshot above was worth a sum total of around 400 Chaos Orbs, or 2.5 Exalted Orbs, at the time it was obtained. This illustrates just how profitable these bosses can be, despite the fact that a powerful build can kill them in only a few minutes at most. Since the majority of fossils and resonators are found behind fractured walls, delving in lower depths purely for the goal of profit is actually a viable strategy. 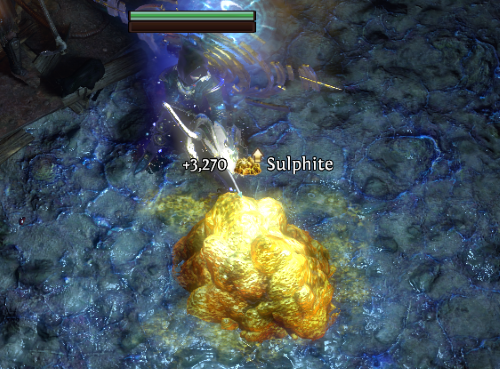 Since the sulphite costs per delve are so low relative to the sulphite a mapping-level player can generate, one can delve for hours or days without the need to refuel. With only a few small upgrades to Darkness Resistance, your exile will also take negligible damage from the darkness. Simply run through the darkness, using flares to reset your Darkness or leech from monsters if necessary. No sulphite is required. Return to a Delve you have already cleared and follow the lit cable, searching for hidden walls. You can “reset” the passage by going to a new node and then returning. Delve as normal and simply run ahead of the cart, exploring the side caves. Our goal is to locate as many Fractured Walls as possible. Fractured walls are typically far more common in longer Delves, as there are far more side areas and opportunities for them to spawn. Extremely short delves are unlikely to have more than a single Fractured Wall, and often none at all. There are several Pros and Cons to this method. What Depth Should I Stop At? Since Delving is technically an infinite system, this question can only be answered by your build. Most builds will struggle to continue past Depth 300+ without dying occasionally, due to the severity of certain biomes. If experience and profit are your main priorities, it is best to stop between Depths 250—300. This allows you to easily farm level 83 monsters and encounter all possible biomes and bosses, but remain relatively safe and risk-free. Simply proceed laterally across the Subterranean Chart, but do not be afraid to deviate upwards or downwards as necessary to chase the most desirable biomes and rewards. Which Nodes Offer the Best Rewards? Prioritize the Delve Cities above all else, as they offer a significant amount of rewards and experience. Map and Fossil nodes can also be great, however, they are relatively rare. Early on, you should prioritize Azurite nodes as often as possible in order to max out the important upgrades as soon as possible. Solo Self-Found players, in particular, may value certain nodes much more highly, as profit is not a concern. Instead, they might gain much higher practical value from the rewards than a player on a trade league. Delving can offer substantial rewards, challenges, and experience. The style of play is also extremely different to mapping, and many players find it relaxing or “autopilot”, as you simply have to follow the crawler and kill everything in your path. We recommend always raising your mine depth to the maximum monster level (Level 83 at Depth 239) as early as possible after you have reached mapping levels, due to the enormous map sustain that cities will provide for you. Even if you are not entirely supplementing your end-game with Delving, you will certainly want the option to leverage the Mine for its rewards when possible.